(0 Customer Reviews) | Write Review 12 issues per year DOG NEWS Australia is a must read for any dog lover. A full colour, 88 page tabloid with over 200 quality dog photographs from Australia, N.Z., Asia & the globe in each issue. This publication offers an interest factor for any canine enthusiast, with a regular Vet column, and articles on dog training, breeding and exhibiting from world renowned authorities in each field. DOG NEWS, while primarily a specialist canine publication, attracts not only dog show enthusiasts and dog breeders but also the dog loving sector of the market place. Welcome to the Winners Edition which celebrates the dogs that excelled in the dog show rings of Australia and New Zealand in 2014. 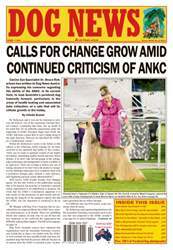 In this fabulous edition are reports from across the ditch where the Inaugural Top Dog New Zealand final was recently held and dog shows are in full swing again for 2015 and also from our north we share with readers a wonderful report on the great success of the recently held Philippines cluster. DOG NEWS Australia is a must read for any dog lover. A full colour, 88 page tabloid with over 200 quality dog photographs from Australia, N.Z., Asia & the globe in each issue. This publication offers an interest factor for any canine enthusiast, with a regular Vet column, and articles on dog training, breeding and exhibiting from world renowned authorities in each field. 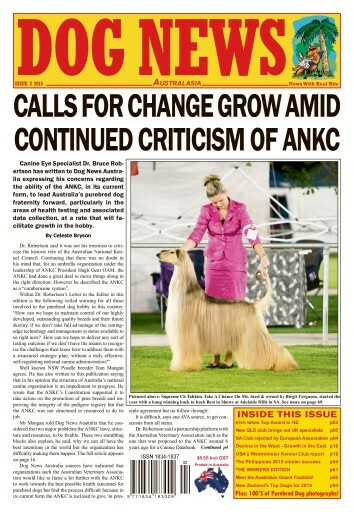 DOG NEWS, while primarily a specialist canine publication, attracts not only dog show enthusiasts and dog breeders but also the dog loving sector of the market place. You'll receive 12 issues during a 1 year Dog News Australia magazine subscription. You'll receive 12 issues during a 1 year Dog News Australia magazine print subscription.